made for the www.1001winampskins.com remix contest 2003. The Terms made up by Leonardo for his original skin apply to this one as well. Find the original readme.txt at the end of this text. When I first saw the Oceano Player – Caribe, I was stunned... this was possible with WinAmp 2 ? It looked so different from the usual. I am not much into futuristic glossy designs, but that one I used for while. With the remix contest I saw my chance to modify this original skin and make it fit for my personal purpose. (www.mexp.dk , a corresponding MEXP skin will be available soon). So I decided to make a player that would look complete without / with shaded playlist. and the playlist and equalizer in winshade mode. and which windows are in winshade mode . 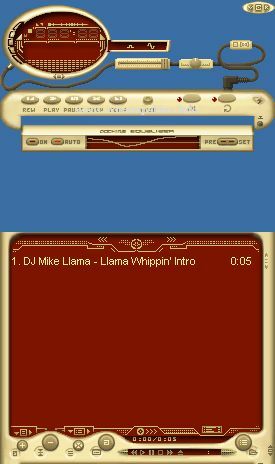 Caribe is a color variation over Red Sea, the second Oceano model, folowing the design I used for a portable player which explores Winamp's transparencies and a different use of Winamp's layout: you must switch the Equalizer and Playlist windows to assemble the device correctly. This model comes also with an integration between normal and window-shade equalizer, creating a "dockable" equalizer, which makes the player even more portable. You're not allowed to copy or modify any part of my graphs, images, pictures, or any bitmap point made by me. If you're interested in reproducing or distributing my skin, please let me know by e-mail.